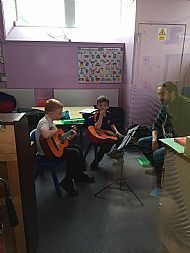 Instrumental Group Learning. These sessions are held on Tuesdays. They provide an opportunity for community members to learn instruments in a more formal setting. We have invited five musicians who teach a range of instruments to provide teaching to groups. 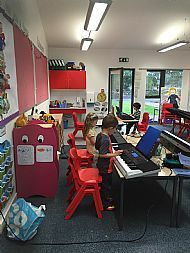 The group learning sessions (for ‘P1’ age group and over) will focus on group learning for piano/keyboard, guitar/ukulele, fiddle, drums. 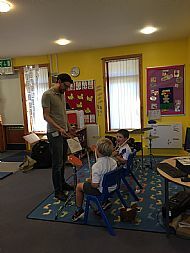 Fun music sessions are also scheduled for the younger participants including the ‘under P1’ age group. 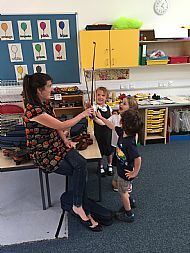 For P1 and over, the fun music sessions will include a mixture of singing and ukulele. 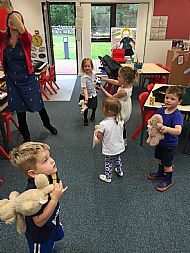 The sessions will be 30 minutes in duration and delivered during the school academic year, during term-time, weekly, from 1530 to 1900, at Farr Primary School (We want to stress that although the venue is at a school it is absolutely open to all residents not just those who attend Farr primary). Fees will be collected at the start of each term for the full term. The next block of sessions will start on Tuesday 22nd August (29th August for violin). 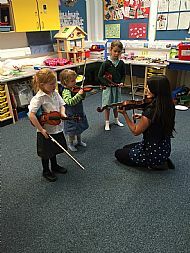 Term 1 will run for six weeks (five weeks for violin) excluding 19th September. If you have not previously registered an interest with a member of the initiative, please do so by filling form B below or available on request by contacting us on strathnairnmusicinitiative@gmail.com, or calling Fran on 07989421821 or Marielle on 01808 521428. Drumming with Marc What's a fiddle bow? In December 2016 we asked for feedback from participants on the group learning sessions. You can view the comments we received here. Most of the improvement suggestions we have managed to address, but, unfortunately, some we have no control over.